That website redesign you just launched at great expense? Forget about it. All those apps you paid tens of thousands of dollars to build? Dust bin. 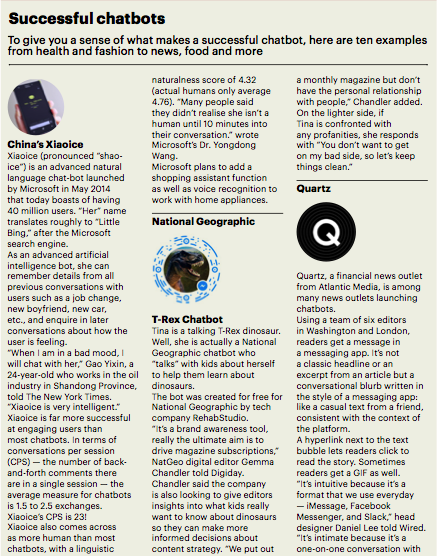 Meet the future: Chatbots and messaging apps. Some tech experts say chatbots and messaging apps will replace all of it. They will be faster, smarter, easier to use, friendlier, more targeted, more secure, more personal, more satisfying, and more widely used than websites, apps, and social media. While we weren’t paying attention in March 2015, the top four messaging apps passed the top four social media sites (including Facebook!) in popularity, according to Business Insider. Chatbots and messaging apps will address consumers’ personal and professional needs and interests and, if a wildly popular chatbot in China and Japan (Xiaoice, pronounced “Shao- ice”) is any indication, chatbots will also become readers’ “friends”. Twenty-four percent of the 40 million users of that Xiaoice chatbot in China and Japan have told ‘her” that they love “her”. That’s ten million people who “love” a robot. You might have only just begun to feel that you have finally managed to get a handle on the whole mobile thing. That’s no small feat. Congrats! So I can feel your pain when you hear that there’s yet another “game-changer” that will force you to alter course YET AGAIN to be able to create new types of content for another new platform! Some of you might not even know what a chatbot is. Ask your teenage children. Or if you have an iPhone and have ever asked “Siri” a question, you’ve used a chatbot. What are messaging apps and chatbots? So let’s set the stage: What exactly are messaging apps and chatbots? MESSAGING APPS: Messaging apps are conversation platforms like WeChat (1.1 billion registered users), WhatsApp (1 billion users), Facebook Messenger (1 billion), QQ Messenger (860 million), Viber (800 million), and Kik (300 million). There are other messaging apps that are photo-based like Snapchat (150 million) and Instagram (500 million). All are designed to facilitate communication between friends, and do not serve as a content feed like Face- book. It’s all about pure, focused, personal chat. And chat they do: Facebook CEO Mark Zuckerberg announced in spring 2016 that Facebook Messenger and Facebook’s WhatsApp together now process 60 billion messages a day, triple what all SMS services did at their peak (20 billion/day). CHATBOTS: Chatbots are interactive text or voice apps that live on messaging apps and that can ask and answer consumer questions. There are two types of chatbots, one is based on rules and can only respond to very specific commands with pre-programmed answers. If a consumer says or types the “wrong” words or asks a question the chatbot wasn’t programmed to answer, the bot doesn’t know what to do. This so-called “rule-based” bot is only as smart as it is programmed to be and cannot get any smarter. The other type of chatbot uses machine learning, or basically an artificial brain, AKA artificial intelligence (AI). So users do not have to ask precisely the right question. Machine-learning bots understand language, not just pre-programmed phrases, and they continuously get smarter as they learn from every conversation. Messaging goes back to the SMS (Short Message Service or texts) that has been part of your mobile phones for a long time, while chatbots go back fifty years to MIT scientist Joseph Weizenbaum who created a psychotherapist chatbot called Eliza that imitated human conversations well enough to convince some users that they were actually chatting with a real psychotherapist. The recent dominance of messaging apps and the sudden explosion of chatbots can be traced to their simplicity and personalisation — for messaging apps, it’s the pure, in-the-moment chatting with friends without any newsfeed or other outside interferences based on algorithms. With chatbots, it’s the ease of not having to launch another app plus the immediate, personal response. The popularity of messaging apps is so great that the users of the top four messaging apps (Facebook’s Messenger, WhatsApp, WeChat, and Viber)) now outnumber the users of the top four social media platforms (Facebook, Twitter, Instagram, and LinkedIn), according to Business Insider Intelligence. Fine. While all that is quite impressive and fascinating, the real question is: How can media companies profitably play in these spaces? If media companies can figure out a way to make a personal connection with messaging app users, those conversations with readers would occur inside the chat environments consumers are already addicted to, not in a separate content app which they would have to open and for which they may not have developed a habit. Neither the web nor bespoke native apps offer media companies the same kind of connection messaging apps do. “[Media companies] can engage with a user on the web or via an app, [but they] consume content and leave, there’s no way to follow-up with them, [and] apps are expensive to get users to install, and few people install apps,” Chatfuel Dmitrii Dumik told TechCrunch. Messaging apps and bots can provide a more engaging experience and may grow to be as important as the mobile app today — just more convenient and light for users, Dumik said. Messaging apps and chat bots are appealing to businesses outside of tech and publishing. 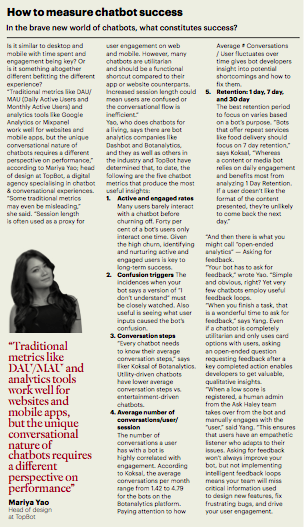 “Aside from technology leaders, large companies from sectors such as finance (Royal Bank of Scotland), toy manufacturing (Mattel), food (Domino’s), media (Disney) and the automotive industry (Renault) now actively use chatbots to initiate dialogues and spur conversations with customers,” wrote Mariya Yao on LinkedIn. Yao is head of design at TopBot, a digital agency specialising in chatbot and conversational experiences. Other businesses like HP, Taco Bell and 1-800-Flowers are also experimenting with “conversational commerce” by employing chatbots on messaging platforms to drive sales. “It’s a rare moment when it becomes clear that a technological revolution is upon us, and I believe we’re in the midst of one such transition right now,” wrote Chris Messina in Medium in September 2016. “Even if you haven’t realised it yet, bots are everywhere. 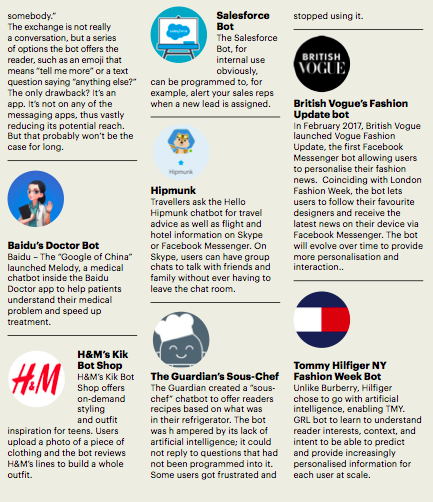 If you’ve ever talked to Siri, scheduled an appointment over email with someone named Amy Ingram, or set up a team meeting with a curiously helpful assistant in Slack, you’ve already had a close encounter with a bot!” Messaging apps and chat bots are coming along at a propitious time in tech and media history. The last big thing — mobile apps — that were once so wildly popular (4.5 million available today) are today so very, well, yesterday. The novelty of trying out new apps is all but gone. No one wants to download another new app to go along with all the other apps they don’t use anymore. In 2016, nearly half of all US smartphone users downloaded no apps. None. Worse, only 13 per cent of US smartphone users accounted for more than half of all app downloads. Worse still, less than 25 per cent of those who did download an app actually went back to their new app the next day, according to Appboy, a provider of mobile marketing soft- ware. By the end of the first week, retention dropped to 11 per cent. So, how is a publisher to get content into consumers’ hands and create a relationship? (messaging apps) where their readers are already hanging out in great numbers. If media companies reach consumers on a messaging app, the reader doesn’t have to stop what they’re doing (messaging), they just use the same messaging app to interact with the publisher. There’s no opening a new app or launching a browser and trying to find the media company’s website. Apparently, media companies will not have a tough sell on their hands. Almost 9 out of 10 consumers (89 per cent) would prefer to quickly find information via a conversation with a chatbot rather than having to open a mobile app or do a web search on their own, according to a 2016 study by Opus Research and Nuance Communications. Additionally, we won’t be blazing a new trail. WeChat has bots for users to shop or pay bills. Facebook Messenger has bots that provide the same kinds of services you’d have to go to multiple websites or apps for: weather forecasts, news updates, flower deliveries. Instead of closing one app and opening others, or opening new browser windows and clicking several screens, Messenger users just tap and send text messages. “If you’re not mobile-native these days, you’re simply not where the world’s attention is,” wrote Salmon. Because communicating with consumers via messaging apps and chatbots is much more intimate and interactive than the comment area of a story or the “Contact us” area of a website, it feels more personal. It’s a bit like having a private messaging thread with the writer you like. 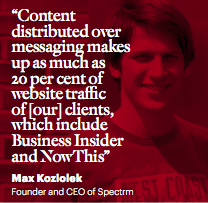 Content distributed on messaging apps also creates traffic back to a media company’s website. chatbot startup, told Media Shift. Chatbots can also go beyond answering questions. If, for example, you asked a chatbot which new movies were opening this weekend, the chatbot could not only give you the titles, but it also could smartly recognise you probably would appreciate getting directions, and knowing the screening times, parking information, and perhaps nearby restaurants, without requiring the consumer to ask those additional questions — something that might not occur to a human customer service rep. Beyond that, chatbots answer questions instantly. We all know what it’s like to be put on hold when we call customer service, or wait for hours or even days to get a reply to our inquiry posted on a company’s “Contact us” site! And for media companies focused on the efficient use of resources, chatbots are easily the most scalable way to communicate with consumers. Period. If the choice is between one writer or customer service rep talking to one person at a time, or a bot talking to or solving problems for tens, hundreds or even thousands of people simultaneously, which would you choose? Of course, not all consumer interactions should be automated, but many can be. And humans can (and do) monitor chatbot interactions with consumers at some companies, ready to jump in if need be. For chatbots using artificial intelligence (AI), the customer relationships and interactions get better with time. “The fact that the AI can understand and predict the best and most relevant articles for each reader means that users are more likely to read, read longer, and share what they read with friends on social networks,” Boomtrain CEO and co-founder Nick Edwards told PubExec. 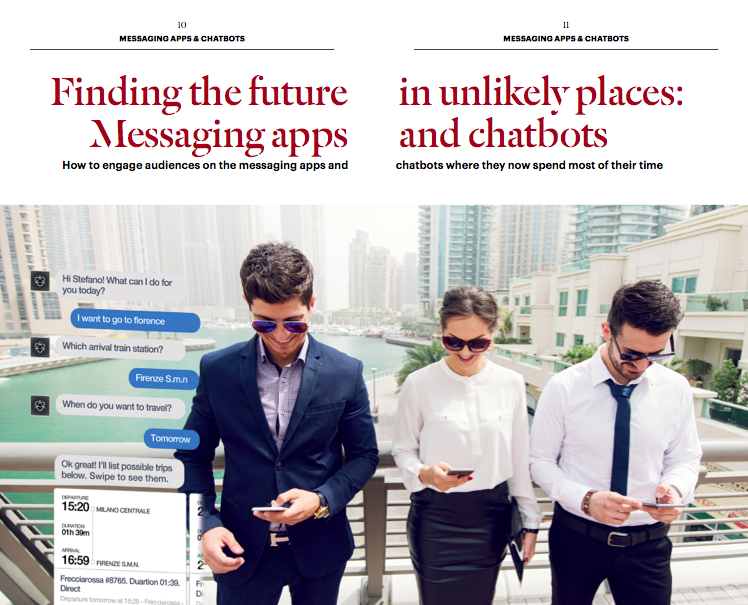 “Our customers regularly see 100 per cent or more increases in email engagement rates and 50 per cent or more increases in social sharing rates” from chatbots. 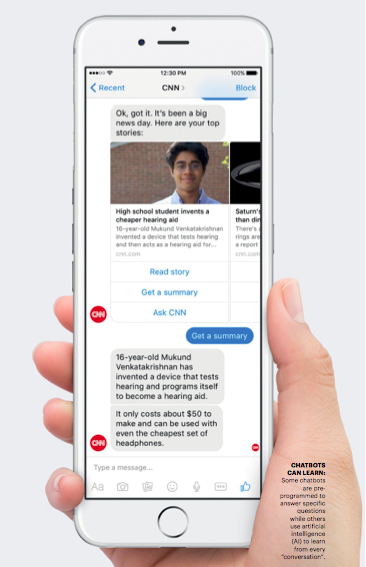 Media companies including Time’s People, Variety and New Media Express (NME), as well as Sky News, the Nikkei Asian Review, the Guardian, Washington Post, and New York Times have all launched chat bots. They are by no means alone. 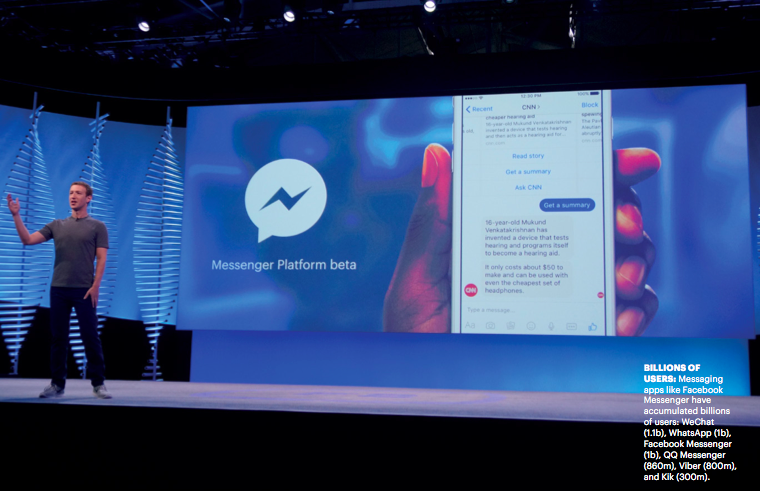 In just five months after Facebook Messenger enabled bots in the spring of 2016, more than 30,000 bots were created, outpacing Apple’s App Store in both growth rate and number of developers. All the gushing and rosy predictions, though, cannot mask serious hurdles and caution signs. In early 2016, Microsoft launched a Twitter chatbot named Tay with the “personality” of a 19-year-old woman. Tay was designed to use artificial intelligence to learn from user inter- actions with “her”. Unlike China’s Xiaoice where the AI learning went smoothly, Tay was “taught” some pretty nasty stuff by online pranksters, and she began to spit out racist, sexist messages. Microsoft was forced to pull the plug after just 16 hours. Bots also must get better at communicating in everyday language. But even if chatbots get more natural at conversations, consumers must still be able to find them, and that’s a real marketing challenge for media companies. How media brands drive people to their bot is not yet clear. “You can’t blast everyone from your Facebook page and get them to subscribe to you on Messenger,” Cory Haik, Mic’s chief strategy officer, told Digiday. “You don’t want to spam users. You want them to opt in, which is a lot more meaningful for us. We’re trying to figure out how to convert them to interact with our bot on Messenger.” One tactic is to use existing Facebook ads to drive traffic directly to bots. A final hurdle will be analytics. As with everything digital, tracking is essential. Previously, bots had very little in the way of analytics, but fortunately, the situation has improved. Facebook has been increasing its analytics. Developers can insert code to bot links, giving media companies a window into the origin of their traffic. And for those of you who have had underwhelming experiences with chatbots, suffice to say that the buzz is not so much about their 2016 iteration but in what they will be capable of doing. As developers make chatbots more human-like with personalities and the ability to recognise and respond to an ever-growing number of speech patterns, the interactions will become richer and more personal. The benefits of messaging apps and chatbots are many. 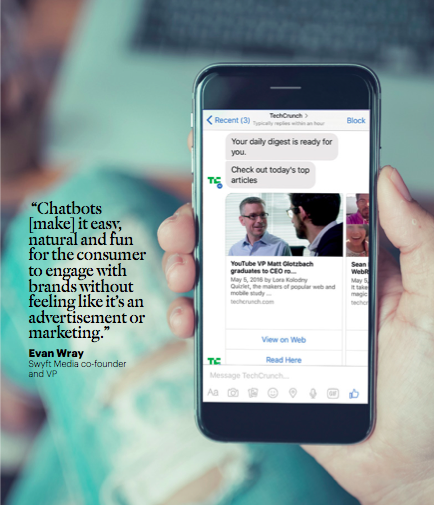 “Messaging apps are the platforms of the future and bots will be how their users access all sorts of services,” Peter Rojas, entrepreneur in residence at Betaworks, told ChatBot magazine. NATURAL INTERACTIONS: “Chatting is second nature to us since we primarily interact with each other through conversation. This makes our use of chatbots much more intuitive and easy than clicking on a bunch of buttons with a mouse in traditional user interfaces. • DARK SOCIAL: And BI.com believes chatbots are especially appealing to media companies because they allow brands to tap into users’ “dark social” activity. Dark social traffic stems from people sharing content privately through IM programs, messaging apps, and email, among other means. 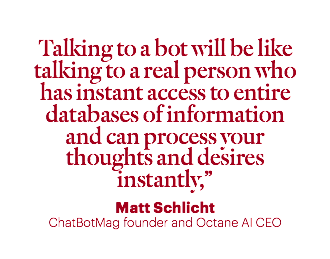 “Talking to a bot will be like talking to a real person who has instant access to entire databases of information and can process your thoughts and desires instantly,” wrote ChatBotMag founder and Octane AI CEO Matt Schlicht. How do media companies make money from bots? OK, so they’re powerful and popular and personal, but do they make any money? It’s still early, and as a result, the media companies experimenting with messaging apps and chatbots are taking the long view. They say they are doing it primarily for learning, audience development, access to young readers, mindshare, and brand recognition to position themselves to ultimately gain a share of wallet on chat plat- forms. The report researchers found that the media companies saw revenue potential in print/chat app combinations, scaling chat app groups around common interests for sponsors and advertisers, and listening to chat audiences in order to create new communities and products that can be monetised. Others envision more possibilities, including subscriptions (pay for access to unique bot or chat app content), native or sponsored content, affiliate marketing, research (for a price), lead generation, pure retail, and cost per conversation. There’s already a term for the transactional revenue piece — “conversational commerce” (using a messaging app or chatbot conversation to move a user to a conversion). The Chinese high-end consumer lifestyle magazine group Trends has already been using messaging apps to drive sales of print editions. “Our business innovation in subscription marketing has been to promote magazine sales with social preheating [promotion] on messaging apps,” said Kai Fei Wang. The strategy of social preheating of “online booking” of magazine sales to high-end readers in China is working. “It worked so well, we created a momentarily out-of-stock magazine!” said Wang. In less than ten minutes, 10,000 copies of the Harper’s Bazaar “White Valentine’s Day” cover (about a popular star) sold out; in 36 hours, a total of 50,000 copies sold out, according to Wang. The company was forced into three press runs. 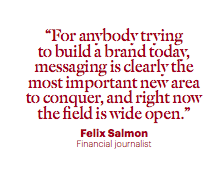 Magazine media companies can also use messaging apps to sell advertising. In late 2016, Facebook opened up Messenger to ads after experimenting with partners Uber and Marriott. In introducing ads to the previously “virgin” territory of social messaging and chatapps, Facebook is focused on ensuring that the user experience isn’t cheapened or abusive or spammy. There will be a system to cap both the amount and frequency of ads. Facebook is also watching the speed with which bots reply to questions as well as usability and how a bot interacts with users, all of which could lead to a ranking system akin to SEO, according to Digiday. In addition to new revenue potential, messaging apps and chatbots are changing how consumers get and act on information. “Chatbots represent a new trend in how people access information,make decisions, and communicate. 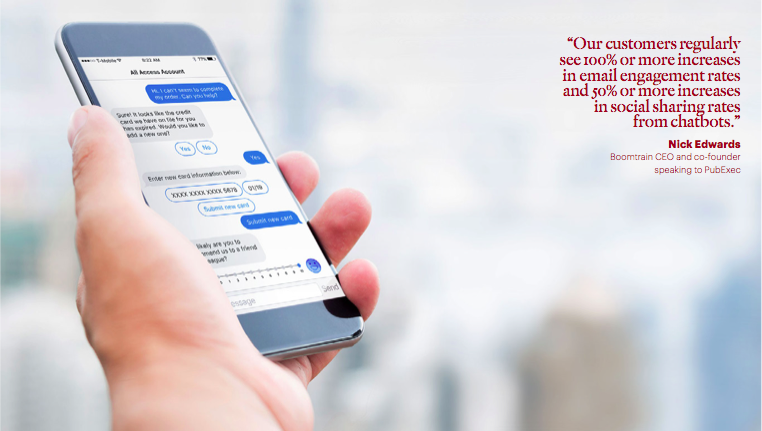 We think that chatbots are the beginning of a new form of digital access, which centres on messaging,” Christie Pitts, manager of Ventures Development at Verizon Ventures, told Forbes. “If your long-term marketing/business plan doesn’t account for IPAs (Intelligent Personal Assistants), you may be in the same boat as those people who said they didn’t need a website in the early 2000s,” Tom Anthony, head of R&D at delivery optimisation company Distilled, wrote on Moz. “They are going to have a profound effect on the way people search, the types of search they do, and the way they consume and act upon the results of those searches. “The shift is inevitable: Businesses must go where their customers are,” wrote Chris Messina, developer experience lead at Uber. “But I hope brands stop and soak up the moment, rather than seeing conversations as another channel for spamming unsuspecting consumers.“With proper forethought and consideration, bots present a new, unpolluted opportunity to build lasting relationships with people,” wrote Messina. “Brands should ask themselves why they exist, and then think critically about how a conversational encounter can support their mission. This article is one of many chapters published in our book, Innovations in Magazine Media 2017 World Report.